Today is Saturday so thinking of posting something less serious (anyway, I have never been very serious in the first place ;-)), or should I said something not directly related to investing but about the ultimate goal of life! Nope, not money, as money can't buy happiness. I am talking about the HAPPINESS itself! 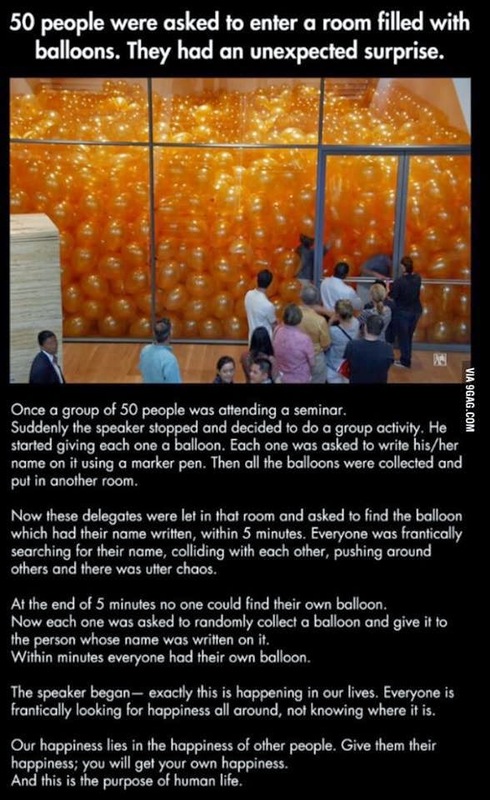 Yesterday, I saw a photo in my Facebook newsfeed (shared by my friend, originated from 9GAG), it is kind of wordy but I am pretty sure that it worth 1 minute of your time in reading through it as it is a great metaphor of what HAPPINESS is all about! I can relate to the game illustrated in the photo as I've just played the same game in one of my company's outing some weeks ago. It is chaos and messy game but the meaning of it is a profound one. Now! Check out the photo of HAPPINESS below and remember to read through the text! Hope we all found our happiness NOW!. Find your moment of happiness now and not soon. Soon it may be over.